Your alarmed and locked unit. Fantastic, friendly service throughout the 5 months I stored here. Clean, easy access, great parking, helpful staff available most of the time I visited (site six days per week). Highly recommended! I have been operating my business from Storage King Revesby for the last 6 months which has reduced my costs, improved my productivity and given me more control over by day to day operation. The Storage King Staff have ensured that reception of all incoming stores and personnel is smooth and efficient whether I am present or not allowing me more time to visit suppliers and customers. One of the best experiences we have had in customer service, staff were very friendly and knowledgeable. Highly recommended!! Thank you to Leslie who was absoutle star in assisting me with all my move questions and making the process so easy! Would definitely recommend Storage King Revesby to family and friends. Very friendly all right but they get you in by giving you good price and after few months bump it up by 25% so be careful with their pricing. Customer service is above and beyond. I cannot say enough good things about the people and facilities. I highly recommend. Very friendly people. Made me feel welcomed, showed me around. No pressure to sell, just inform about the facilities. Amazing staff who are always willing to go above and beyond for their customers! Fantastic service and a top-notch facility. The storage sheds are integrated within a warehouse building so they never get hot - even on a 40 Degree Day. Access is 24hrs and there are plenty of trolleys and carts to use. This is the best storage service of its type in the area. First Class Facility and First Class Service A pleasure to be a client of Storage King Revesby since the launch of the business . Perry and his team look after their clients needs in a genuine friendly and helpful way . 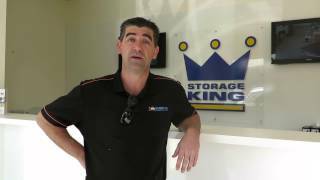 Perry and his team at Storage King Revesby provide friendly, knowledgeable service that is first class. After my initial email contact, I received a phone call that afternoon to discuss my enquiry in detail. Perry provided a wealth of information, communicated so clearly I was left with few questions of my own. The use of a courtesy truck to move your belongings in was a real time and money saver. The facility is clean and secure as you would expect, but the level of customer service is the real stand out. A big thank you to Perry and his staff for a hassle free transaction during an otherwise stressful house relocation. After spending months trying to find storage space and looking at old, dusty, dark and damp units - Storage King Revesby opened up and blew us away! It is brand spanking new, bright, airy, easily accessible, very secure and way ahead of the other storage spaces we have seen in this area and others. Every unit is alarmed, there are lifts and trolleys always available to help you get your stuff in and out, the staff are very friendly and helpful and to top it off prices are extremely competitve with excellent discounts and spotters fees for recommending your friends. You wont be disappointed! At Storage King Revesby, we are the newest Storage Facility in the area and our friendly staff, are ready to assist you with your storage needs. Our new centre incorporates state of the art 24 hour monitoring systems and all the units are individually alarmed to ensure what you store is safe and secure at all times. We have small and large units available and a large range of boxes and packaging materials to help make your move/storage experience a simple and easy process. We cater for commercial and domestic customers with 7 days a week access. Storage King Revesby proudly services Padstow, Panania, East Hills, Picnic Point, Revesby Heights, Milperra, Condell Park, Bankstown and Punchbowl.